* $35 per day special based on minimum four (4) day hire. All of our car rentals have air-conditioning, power steering and stereo or CD players and all cars are safety checked and carefully cleaned inside and out prior to delivery. Included in the price is a 24 hour breakdown assistance. Some of our cars also have cruise control. 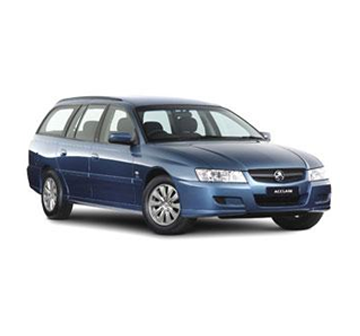 Holden Commodore Wagon with cruise control, Toyota Camry CSI Wagon or Toyota Avalon with cruise control. We recommend the Wagons & Larger Cars to anyone who wishing to rent a car who has requires a large amount of luggage or who plans on touring with teenagers or adults in the back. Taking advantage of our Off Peak Rates means you can afford to hire the Camry for just a few dollars more per day then the standard Camry. That is why the these larger cars are some of our most sought-after car rental options.